Early this week The Body Shop launched a hotly anticipated new line – Wild Argan Oil – to help you get your Moroccan hammam on at home. While all the usual suspects are there – a shower gel, body butter and scrub – the range also includes a few interestingly l’il extras, namely a massage soap (R40), a solid oil for your lips (R60), another for your bod and hair (R110) and, of course, the Radiant Oil for body and hair (R220). Everything in the line’s infused with hydrating Community Fair Trade argan oil from Morocco and has the same soft, pretty scent. The best way to describe it would be a little nutty with the teensiest dash of something sweet, possibly sugared almonds. Or maybe marzipan. I reckon anyone who appreciates TBS’s Almond or Shea Butter or Brazil Nut line will like this one too. How kak does my pic look by comparison to The Body Shop’s? This is why I hate mixing PR pics with my own. Going clockwise, you’re looking at the oil, the solid body and hair oil, the scrub and body butter. Of everything I’ve tried, I most like the scrub. 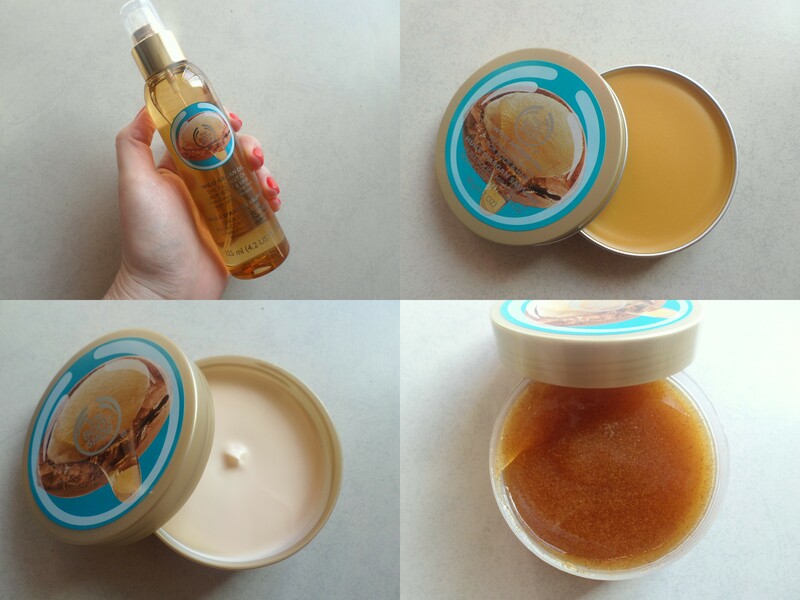 It’s one of The Body Shop’s grainier, more effective ones. I also like the oil itself. Being a dry oil, it sinks in fast yet leaves your skin feeling supple with a healthy-looking glow. I’ll definitely be slapping it on legs and arms this summer. I’ve become a bit of a freak for oils lately and have been favouriting them over body lotions which now just seem sad and boring, kind of like the sitcoms we used to watch back in the day when you compare them to the killer TV series being churned out right now. Can you believe how much of your life you wasted watching Three’s Company? Sjoe! And is anyone else counting the days until American Horror Story: Freak Show starts airing on Hulu? Errrmigod! 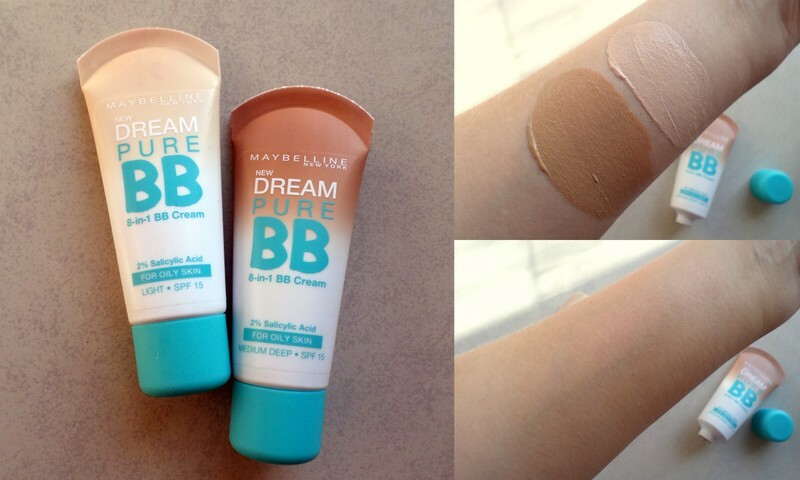 Moving on… Maybelline’s launched yet another BB – Dream Pure BB cream (R99,95) for oily, spot prone skin. Available in three shades, it contains 2% salicylic acid to help exfoliate deep inside your pores, keeping them clean and clear. Light on the left and Dark on the right; swatches top right and the Dark shade blended into my arm on the bottom right. Being an oily-combo girl I was keen to give this a bash and found it to be rather nice. As it’s super duper sheer, it’s not going to cover anything, but this means you can go a shade darker than you’d usually choose and use it like a tint. As it’s less ‘creamy’ than Maybelline and Garnier’s other BB’s, you need to apply it on top of another moisturiser so that you’ve got a little ‘slip’ to smooth it around your face, so it’s not really a tinted moisturiser (which, if we’re honest, is what most drug store BB creams are) – its more of an incredibly sheer foundation. I liked that, once on, it stayed put, didn’t oxidise nor encourage any oilies or excessive dewiness. In short, it’s a nice pick for anyone looking for a hint of a tint with added blemish prevention benefits. Last but not least, let’s talk about Smittens (R100, Beauty-Worx.co.za and more stockists listed on their Facebook page). How much do we love my super macro close up? A million years ago I reviewed Jane Iredale’s Magic Mitt and was really impressed. Essentially, it’s a micro fibre mitten that removes every trace of make-up without the need for cleanser due to the way it’s woven which kind of gives your skin an incredibly gentle yet effective microdermabrasion session every time you use it. The only negative I could think of in regards to Jane’s mitt was the price point. Her goodies are great, but they don’t come cheap. So, Ive been thrilled to discover Smittens. They’re pretty much a dupe for the Magic Mitt in that they do the exact same thing but, as they’re proudly South African, they’re almost half the price. For those of you who’ve never heard of or used a micro fibre cleansing mitt before, let me clap your biggest questions. Yes, it does remove make-up, dirt and oil without leaving your face feeling stripped. Yes, it even takes off waterproof mascara. And yes, I know you don’t believe me. You’re sitting there thinking there’s no way my face can be clean or feel clean with just a little water and a fancy cloth but just trust me on this one. These babies really are quite magical. If you’re a jaded beauty junkie who’s seen it all but yet to try one, add a Smittens to your shopping list. Also, if you’ve got a ‘girl who has everything’ in your friendship circle, you can add ‘em to that super short list of things so probably won’t own already and is guaranteed to be impressed with. I seriously love my Smitten. I used to be a face wipe girl then I found the damn Catrice mascara won’t budge. 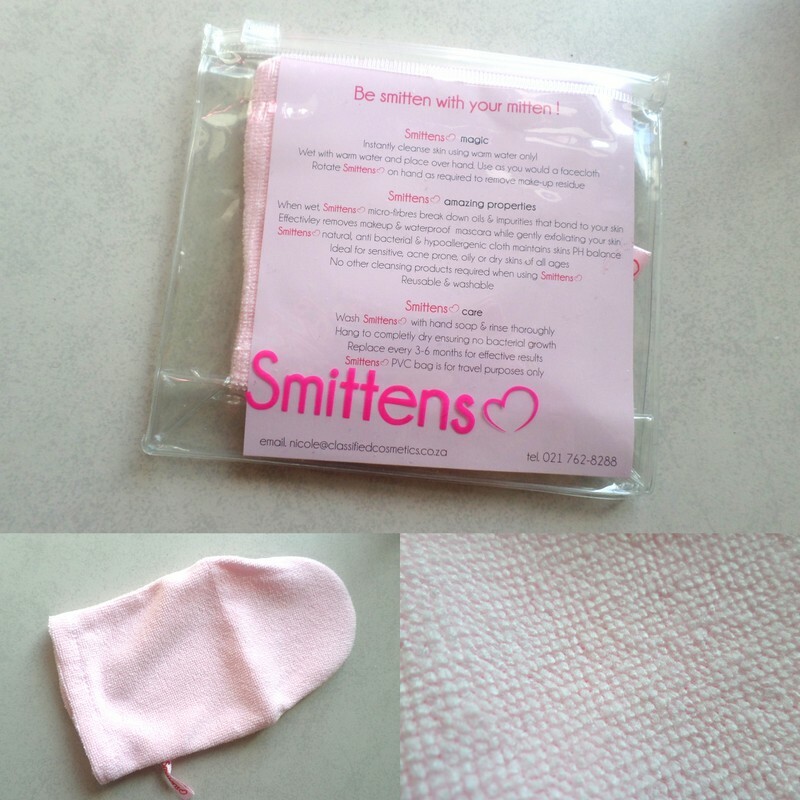 Smitten sorts the problem out one time and my skin is in much better condition! Ja, it’s a serious gem, hey? I have to try Smittens. Cause I still don’t believe you 😉 My mind says you are all talking crap. Ha-ha. On the shopping list. Hey Leigh, do you think these Smittens would be good for lash extensions? IE do they have a no-snag/lint-free vibe to them? That is very nice indeed. Exactly what you need for a day of pampering on a weekend!